The path to success is littered with great ideas poorly marketed. Don't let yours be one of them. "A little book with a very big message. Your idea is worth a great story, well told." Make Your Idea Matter is a call to action for entrepreneurs, startups, emerging brands and anyone with a great idea, who knows that to stand out in today's noisy world they need to tell a better story. It is full of bite-sized business and brand storytelling ideas originally sparked on Bernadette Jiwa's award-winning business blog TheStoryofTelling.com. Use this book as both inspiration and guide to help you tell the best stories you can tell about your business, your ideas and the work that matters to you. You don't have to start on page one and work your way through, or even read it from front to back. Each topic stands on its own so dip in and out. Reawaken a thought or an idea you've already had. Spark new ones. Discover different ways of thinking about your business, what you do and how you tell your story. Then go make your idea matter. "Every story you tell is a choice, and the choices you make matter. For best results make the choice to read this book." 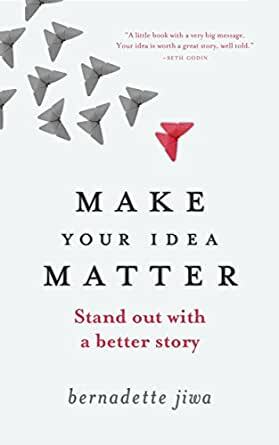 "Make Your Idea Matter' is a book that's easy to get into and hard to escape. Full of valuable, original, engaging content. Bernadette Jiwa has been likened to 'a female Seth Godin' and I have to agree." "The most brilliant people I have known have the rare ability to distill complexity to an essence. This is what Bernadette Jiwa does for entrepreneurs in Make Your Idea Matter." "If I discover one useful insight in a business book, I consider the time well spent. This surprising little book delivers them in spades!" "Now is your time to make a difference, your time to be the best at what you love doing, your time to use your skills to enrich not only your own life, but the lives of each and every individual you do business with. More and more small businesses are taking impressive leads in their industries, making giant multinationals look cumbersome and unfriendly in comparison. You can do the same, and the first thing on your "to do" list should be to read this book. Bernadette has written a fantastic collection of stories to inspire, to provoke, to make you think, to generate ideas, and to bring your business to the next level. It doesn't matter if your idea has been done before, because as Bernadette rightly points out, it hasn't been done by you." Sort of bland. I've read many of the author's other books. Similar structure - short chapters, not a lot of content. More or less a lot of quick thoughts made into chapters. I get the feeling that the author had a lot of material not sure what to do with it and decided to put the journals/thoughts together in this book. I used to read this book like a devotional, I couldn't get enough, I would read and think and ponder, and look for ways to use it in my business. The different chapters will leave you thinking. Yes your ideas matter, but how do you make them matter to me? - Well that's what this book is about. It's chock-full of practical tips and examples. Great marketing wisdom. What I most like is that she presents it in micro-chapters one or two pages long. This makes the absolute best use of your time as a reader. I finished this in an hour. Any other author would have wasted 20 or more hours of my time presenting the same or similar information. Life is short. I don't like wasting it. 5.0 out of 5 starsBeautiful and inspiring. Maybe I am on great mood at the moment I'm writing this review, or this book is just a beautiful compendium of great thoughts from Bernadette. Very inspiring, and great set of tools as well. I hope you enjoy this quick read as I did, and you feel in so great mood when you finish it, as I do right now. Have a great reading. The author mentions that most people abandon a business book after reading 1/3 of it. That won't happen with this book, firstly because it is short and can be read on a 2 hour flight, and secondly because has so many compelling and intimate "moments of truth" for everyone that thinks about why business succeeds at a human level. For the same price as a cup of coffee and its quick hit, you can buy this book and give yourself a ongoing set of prompts and questions and measures to use to challenge yourself to improve your business. You can also use it to provide meeting agendas or discussion points or even briefs for service providers related to your brand, positioning, values, value propositions and customer connections. Buy your business friends this book instead of that next cup of coffee!